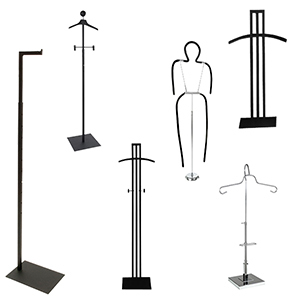 Adjusts from 49" - 78"
Height - 48", Arms - 19", Legs - 41"
19" Hanger, Base is 12" x 15"
Adjusts from 55" - 72"
Choose from a range of costumers to give your retail store a professional appearance that customers will enjoy. These versatile metal frames provide a high degree of adaptability due to their ability to hold both Molded Forms & other apparel pieces. Costumers are easy to maneuver and can fit in smaller areas that mannequins and other forms may not be able to fit in! At American Retail Supply we offer Costumers in multiple different styles, each tough, durable and built to last. Pair Costumers with garment racks to create a unique presentation of your products that is appealing to your customers and a reflection of your store's style! To speak to a Product Expert, please contact American Retail Supply at 1-800-426-5708.